The presence of roses in gardens transcends time. Roses have always been, are today, and will forever be, not only a plant member of our gardens, but most often the featured plant in our gardens. And this happens simply by default, because nothing has as great a floral color impact in your garden as a rose. Humans have an ongoing love affair with roses. And to that end, we have created many different garden designs, most of which leave space for the rose. Whatever your garden style, a rose is a welcome addition. Roses are in English gardens tucked in with lavender, foxglove, daisies, and delphinium. They are in wildflower gardens with poppies, forget-me-not, love-in-a-mist and clarkias; they stand in rows in formal rose gardens and gather in circles in the informal rose garden, and please believe us, they are in vegetable gardens too. Roses are planted en masse as a flowering hedge, roses are planted in commercial settings, roses are in our cemeteries, and roses are growing in the wild. We think you may be getting the picture. 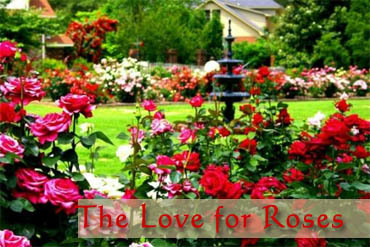 There are thousands of different roses, wild or species, hybrids, old roses and modern roses. There are China roses, Gallica roses, Damask roses, moss roses, Bourbon roses, hybrid perpetual roses, rugosa roses, macranth roses, ramblers, and polyanthas. And we haven’t even begun to talk about the roses in our garden center! We welcome you to join us in the garden center for a stroll through the roses. Donâ€™t forget to leave a few spaces in your garden for your favorite ones.